The problem I got in to with blogging, and many many other things, I guess, is I get in this state where I feel like I’m too busy to put anything down. I mean, I don’t feel like I can do a new post justice. So I don’t bother. Or I’ll create a number of new posts, all drafts. Or, I will keep up with it, but end up giving it up because it becomes too much of a timesink. Anyhow, my twitter account has been filling the gap. It allows me to put down random thoughts, links, etc without all that editing or worry about composing. That’s not strictly right: sometimes I go through a couple of edit cycles to fit things in the 140 character limit. Then again, brevity is not a bad thing. Since it’s been a while since I created a full fledged post, I figured I could put down what I’ve been up to over the past month or so. Since Bea was too young, really, to watch tennis (and stay quiet), I babysat while Heather went to the tennis matches. (I like tennis, but not enough to sit through as much as she did.) 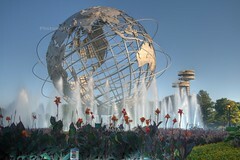 I spent a lot of time with Bea, often in Flushing Meadows – Corona park, which was fun. 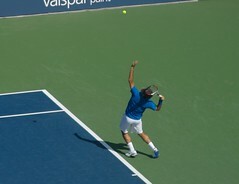 We all got to see a lot of world class tennis (plus quite a few celebrities). We were pretty much booked the whole time, although Heather & Holly went to the Today show on Labor Day. I went in to work one morning as well. Our friends Jackie & Paul were visiting, and arrived the day before we got back. The day we got back, one of our AC units failed. We got that all fixed, and the next weekend we traveled to Austin to attend the Austin City Limits Music Festival. 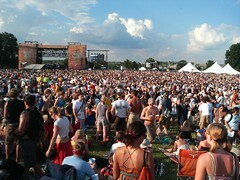 I really enjoyed it, but sitting in the Texas heat for 3 days (with 60,000 friends) was quite draining. When we got back, Heather, Beatrix, and I all came down with colds. We’ve finally shaken them. Now you’ll have to pardon me while I go curl up in a ball and take a nice long nap.